The 1000th Jackson Hole Hootenanny stunned and amazed a sold-out house on September 16, 2015 at the town’s Center For the Arts. The Wyoming event’s regular acoustic musicians warmed up the stage for the return of some much-missed performers, in a one-time venue much larger than the bar/restaurant that has hosted the event since 1993. Fans of the Buffalo Grass Trio enjoyed the sweet harmonies of Wayne McKenny, Jack Sallee, and Jerome Young. There was also a reunion of Sherry Stewart and Jenny Landgraf, who had performed as two-thirds of a trio called the Girls in the 1990s. Viewers of Hoot in the Hole, the first music documentary about the Hootenanny, would find many familiar faces at the one thousandth Hoot on record. Regulars Bill Briggs, John Byrne Cooke, John Kuzloski, and “the Singing Cowboy” Greg Keckler performed at the sold-out anniversary show. 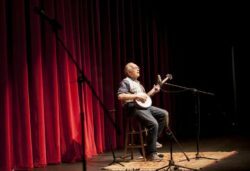 Starting in the 1950s as a sporadic gathering of traditional folk musicians, the Hootenanny has thrived since 1993 at its regular home, Dornan’s in Moose.